Add a touch of avian style to your hanging items using the Whitehall Cardinal Nature Hook. This detailed, lovely hanger can either bring a surprising bit of sculpture to your yard, or further your cardinal garden theme. 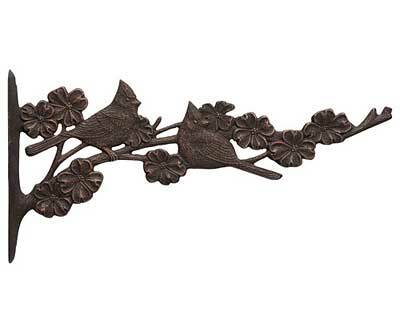 Two cardinal shapes sit attentively on an extended branch, surrounded by blooming flowers. The branch shape curves upward at the end, to easily hold your bird feeder, lantern, or wind chimes. The 14.75" length accommodates items up to 28" in diameter, and the bracket's aluminum construction ensures it remains viable and durable for several seasons. The dark bronze colored finish adds a natural look to the item, while the lighter bronze colored sections offer dimension. Attach this hanger to a post or wall using the two included screws, for a simple yet dramatic accessory. Display your hanging items with style using this Cardinal Nature Hook. Made in the USA.